Ohio’s 14 public universities, including Wright State University, are launching a statewide communication campaign designed to raise awareness of the value of public higher education and spur efforts to close the state’s increasingly alarming higher education attainment gap. 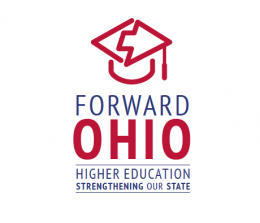 To accomplish this goal, the effort, called Forward Ohio, seeks to mobilize public support for enhanced investment in public higher education and ensure that it is a public policy imperative for state government. Studies indicate that about 66 percent of jobs in Ohio in 2025 will require postsecondary certificates or above. Currently, just 44 percent of working age Ohioans have these credentials. Given the fact that Ohio public universities produce the majority of skilled workers in the state, maintaining a strong system of public higher education is essential to closing this gap and meeting the economic and workforce needs of our business community. Wright State has been committed to providing access to high-quality, four-year education for 50 years. Essential to that effort has been to maintain the high quality of programs the university offers at an affordable price. In February, Wright State proudly announced it was adopting the Wright Guarantee Tuition Program that locks in the same annual cost of tuition, housing and dining over a four-year college career for newly admitted, degree-seeking undergraduate students who are Ohio residents. The program is poised to enhance degree progress, increase graduation and retention rates and make budget planning for a college education more predictable. A textbook savings pilot project is also reducing expenses for students at Wright State. Students who participated in the Inclusive Courseware project during the spring semester saw the cost of their textbooks and/or online access content dramatically reduced, saving more than $56,000, with an average savings of 40 percent. Estimates for an expanded pilot scheduled to begin in the fall semester involving 40 courses are for a savings of about $300,000 for courses utilizing printed textbooks and $110,000 for courses utilizing e-books. Forward Ohio’s information portal illustrates how all of Ohio’s public universities are addressing the attainment gap and providing significant value to the state. It also provides evidence on the critical need for more skilled workers and how enhanced state investment and policy reforms can further assist public universities in closing the attainment gap. Furthermore, it provides opportunities for citizens to advocate for enhanced governmental support of higher education.